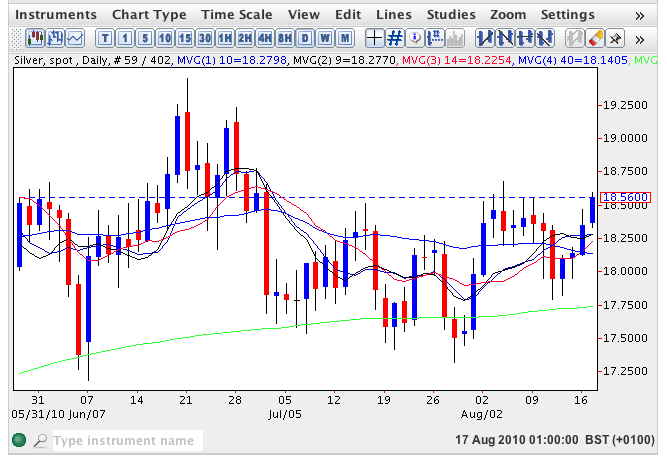 Spot silver followed the gold price higher yesterday breaking above all four moving averages once again and ending the silver trading session as a wide spread up bar with a small shadow to the upper body. Given yesterday’s momentum we now need to wait and see whether this converts into further upwards pressure which indeed seems to be the case in the early silver trading session with the spot silver price trading higher at $18.54 per ounce. The key for the next few days will be whether this current price action has sufficient momentum to break above the short term highs of $18.68 and from there to re-test $19.23 in due course. Should this occur then the daily silver chart will be signalling the development of a longer term bullish trend which once established should see silver prices breach the $20 per ounce price handle in the medium term as a result. To the downside the 200 day moving average continues to provide an excellent platform of support as we now await the breakout from the recent sideways consolidation of the past 3 months.